The New Haven Register press building is full of ghosts. Half of the New Haven Register press building, still occupied by the newspaper’s reporters and administrative staff, hums with florescent lights and muffled typing. But in the printing area, the rooms are gapingly empty. The building was a Gant shirt factory before being purchased by the newspaper in 1981. One room holds rows and rows of the Register’s characteristic red curbside newspaper dispensers. Arranged in tight lines, they stand like grave-markers. The two presses loom in another room; they stand two-stories tall, as huge and silent as two dinosaur skeletons in a monumental hall. Cylinders that once whirred with heavy rolls of newsprint sit empty. Their stillness feels unnatural. “When the presses were running it was a very busy, loud, mechanical operation, ” Ed Stannard, a long-time Register writer, told me. “When they were moving at top speed, there was a lot going on, paper flying through. It was very exciting.” The presses ground to a halt in March when, in an effort to slim down, the Register outsourced its printing from New Haven to a press in Hartford, hoping to sell the building and move downtown. Since then, the rooms have held only the ghosts. That is, until recently. For one weekend in October, Artspace, a local art venue with exhibition spaces across New Haven, filled the press rooms with art for its annual Alternative Space weekend. “We try to find a different vacant building, and a lot of times we try to find something that has some kind of cultural significance to New Haven. [Local artists] are interested in breathing new life into that and making the place come alive again, if only temporarily,” said Open Studios Coordinator JP Culligan. On October 20 and 21 nearly two thousand visitors streamed around the presses, staring up at the machinery. Around 130 artists from around Connecticut contributed work to the show, canvases and frames and photographs filling the ink-stained walls with color. In one room, the empty newspaper dispensers were arranged into paths, guiding visitors from video projection to video projection. Push for Fire, a piece by local artist and Quinnipiac professor Greg Garvey, showed a man’s bathrobe as it burst into flame. It crumpled into twisted black ash. A tie, a jacket, a pair of leather shoes followed. But the Register’s current location has been a New Haven landmark for many years. David K. Thompson, a photographer native to New Mexico, was drawn to the possibility of using the Register for an installation. “I wanted to interact with the machines themselves,” he told me. In his piece, titled Off Register in reference to a printing term for misaligned elements, a video projection played on the rhythmic copper slats of one of the presses. The metal shone with the light of the projector and a film of people in motion shone on its surface. Artifacts of communication sat in front of the press—antennas, stacked television screens displaying static, speakers blaring mechanical noise, a thick book bolted shut. “The main motivation of this piece was to add a reanimation to the machinery here . . . to show some movement in there when the movement’s gone,” Thompson explained. Some artists, including Thompson, created work informed by the decline of print. For Greg Garvey, the Register’s resident ghosts were ominous. “In the room where the video is being shown, there are all these newspaper dispensers, and I made an instant mental comparison to one of the final scenes in Citizen Kane, when there are all these crates and boxes in his mansion after he died,” he told me. Noel Sardalla, a local artist, stood in a small, empty Register office as visitors to the exhibit streamed in and out. One by one, carefully, he threaded paper flowers from the floor beside him onto fishing line. 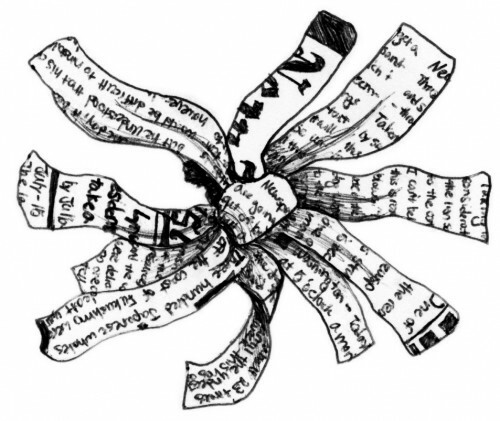 Made from newsprint, the flowers were delicate and small–each only a few inches across. The line formed a net, attached to the ceiling, that hung a few inches away from the wall. The flowers suspended within it seemed to float. The piece, titled The Paper It’s Printed On, contained the text of hundreds, thousands, of newspaper articles; nutgrafs and decks, all folded into one another, swinging gently in the air. The flowers moved slightly in the breeze of a visitor who walked by briskly, looking at the phone in her hands.